Pin Hook, Texas, aka Pinhook, Texas. First settlement occurred prior to 1836. The source of the name is lost to history, although one suggestion is the crooked course of the town’s major street. Pin Hook had once been applied to the area where present-day Paris is located and it is believed that was the source. The local school was named Faulkner after a prominent citizen which set up a rivalry that was to endure until settled in 1988. 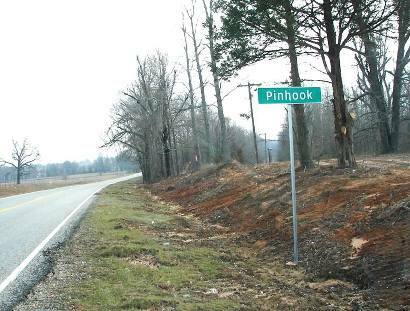 Periodically (since 1946) the sign designating the town was changed between Faulkner and Pin Hook. The matter was settled in favor of the name Pin Hook by the Lamar County Commissioners Court.